Dr. Neil deGrasse Tyson has announced 10 live multi-media events across the United States with one of those stops being right here in Grand Rapids. 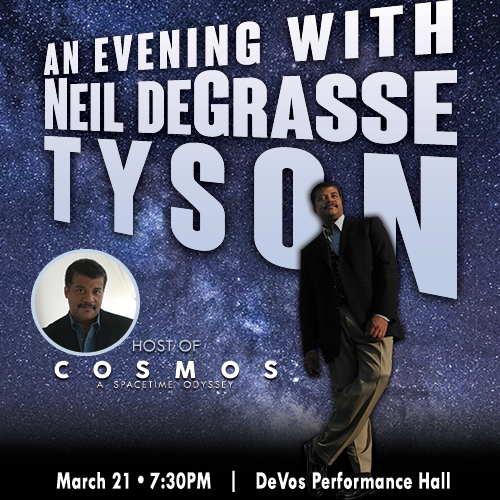 Tyson will appear in Grand Rapids at DeVos Performance Hall on Monday, March 21, 2016 at 7:30 PM. Tickets go on sale Friday, November 6 at 10:00 a.m. and will be available at the DeVos Place® and Van Andel Arena® box offices, all Ticketmaster ticket centers, online at Ticketmaster.com, and by phone at 1-800-745-3000. Ticket prices are $95, $85, $65, and $45. VIP tickets including a meet and greet will be available for $250. I’ve put together an engaging multi-media presentation that brings the expanses of modern science directly to audience members. Fans love the Q&A sessions that rival the event itself. These are family-friendly events. I’ll frequently take questions from children since I’m fascinated with young ones who are interested in science. In the past, he’s been asked questions spanning from everything from space elevators to parenting tips. The New York City native is host of StarTalk Radio and TV show along with FOX’s Cosmos: A Spacetime Odyssey; he is a New York Times bestselling author of 10 books and is also a frequent guest on The Daily Show. President Bush appointed Tyson in 2001 and 2004 to serve on commissions studying the future of the U.S. aerospace industry and the implementation of the U.S. space exploration policy, respectively. Tyson is also the recipient of 18 honorary doctorates and the NASA Distinguished Public Service Medal, the highest award given by NASA to non-government citizens.